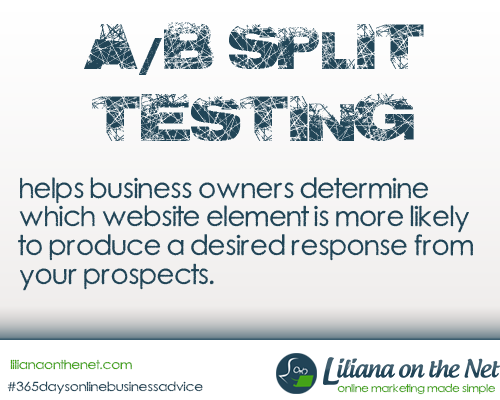 A/B Split Testing helps business owners determine which website element is more likely to produce a desired response from their prospects. You should constantly be trying new things with your landing pages to see what converts and what doesn’t. You could be losing out on major profits if you don’t split test your landing page. The key is to only change one thing at a time. • Two headlines to see which performs better. You simply make two versions of the same page, with the only difference being the headline, so you are more likely to pinpoint EXACTLY what is causing the change in response. The key is to only change one thing at a time. Subheadlines: Do the same with your subheadlines as you do with your headline. Product Offer: Try different calls to action. Colors: Test background colors, headline colors, etc. but test one color element at a time. Fonts: Test different fonts in headlines and in sales copy text but again, test them one at a time. Graphics: Test different product images, guarantee graphics, website images, etc. Price: Test different price points for your product. You can conduct split-testing through a wide variety of software programs and you may already have some available to you through your shopping cart, your autoresponder and other services. Use the URL shorteners for free such as bit.ly or goo.gl by setting two different versions of what you are testing. There are many more but the most expensive ones take a lot of learning and this should be undertaken when your business merits it. Of course, what you test will depend on your unique website but the point is you can discover a great many things by performing simple split tests. After you have tested different variations of your online advertising, you can quickly determine exactly what works and what doesn’t. Then you can adjust your online marketing strategy and future advertising. People have doubled the sales of a product with split testing and concentrating on the best way to present their offer. You could be throwing good money away over and over again on advertising that doesn’t work without split testing. I have never heard of splt testing.. but it does sound like something to try out on my domains..
That is a great concept! I love how simple it is to create but how effective it is in providing an answer to which is better! Thank you for your comment, I hope my post helped. Huh, I never heard of this before. Definitely something to look into more. A great read. I never thought of trying it several different ways with only a minor tweak to see what works best. Your tips can be applied to me and writing my blog as well! I remember learning about this in a marketing class awhile back. Thanks for the reminder, it’s a very effective thing to do. I wouldn’t have the slightest clue how to go about doing it, but the idea is really smart. I totally see the value in it. Liz recently posted…Hershey’s Spreads Make Salty (and Sweet) More Delicious! Heard of split-testing before but not tried it yet. You made it a bit more comprehensive for me. Thanks! I have never heard of split testing before. But after reading your article, I really want to test it out. Thanks so much for sharing! I’m still learning the ins and outs of online marketing. This helps a lot! I have never heard of split testing before but this is an interesting concept to use; I’ll try it out in the future! This is great to know – I am so clueless about this sort of thing & need all the help I can get lol. Very good information for another person on the clueless couch. Aka. ME! 😛 I will have to give this more consideration in the future as I make my goals for online business and such. I am not 100% still the direction I am going to go with my side business I’m considering. I think baby steps do it. Do not overload yourself with information! I have not yet tried this. Thanks for the post, I may have to look into it more. This is a great idea! I’ve got 3 redesign project I’ll be working on soon. I may have to use this method. This is great information! I always wonder how people test what works best on their page! Thanks for sharing! I never heard of this before but it looks interesting! These are really great suggestions! I am sure they will be a huge help for so many! I have never heard of split testing, but honestly I am tech challenged when it comes to my website. That’s why I am a great believer of baby steps and just introducing one technique that suits you before another and thus avoiding information overload.